MINI One and MINI Cooper go on sale in the UK on July 7 and prices have been announced that will set the pulses of MINI fans racing. MINI One will have an on-the-road price of £10,300 (retail list price of £9,900) and MINI Cooper will be available on the road at £11,600 (retail list price of £11,200). With its wheel-at-each-corner design, wide track, low centre of gravity, short overhangs and a torsional stiffness two to three times greater than any other car of its size, MINI driving dynamics should be excellent. A fast steering rack and BMWs state-of-the-art rear Z-axle suspension should give razor sharp reactions in complete safety. Electronic driving stability systems will help to keep MINI under control and pointing in the right direction under extreme driving conditions or in an emergency. These include ABS (anti-lock braking system), EBD (electronic brake-force distribution), and CBC (cornering brake control) as standard. BMWs Dynamic Stability Control System (DSCIII) is an option. Four airbags come as standard with an additional head airbag system also available. 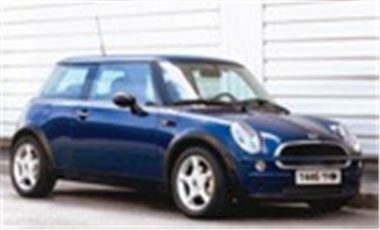 MINI One offers 90 bhp producing a top speed of 115 mph and a 0-62 mph time of 10.9 seconds. Maximum torque of 140Nm (101 lb ft) at 3,000 rpm ensures MINI One maintains excellent mid-range pull.